10. "Of all the talk shows, yours is most geographically convenient to my home"
9. "Did you know you wear the same cologne as Muammar Qaddafi"
8. "Your extensive plastic surgery was a necessity and a mistake"
6. "Honestly, Dave, I've always found you to be a bit of an over actor"
5. "I'm just glad your show is being given to another white guy"
4. "Thanks for letting me take part in another hugely disappointing series finale"
3. "You are to comedy what I am to comedy"
2. "Thanks for finally proving men can be funny"
1. 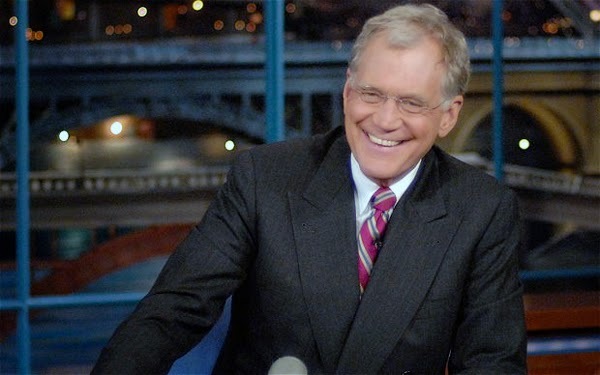 "I'll never have the money I owe you"
The only person who could hold a candle to David Letterman was Johnny Carson. Jay had his moments. Jimmy offers young quirky fun. But they can't hold a candle to Dave. Life & Faith in Caneyhead. I miss Dave already. Was sad to see they tore his set down the very next day.Making my way around on the A to Z Road trip! Stopping by to say hello and I hope to see you again next year, if not sooner!